The use of a video surveillance in the world of business is becoming an essential necessity. 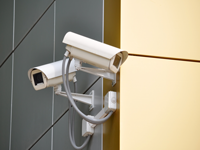 Video Surveillance systems are used for various aspects in a business. Whether it is monitoring employee productivity, reducing vandalism at the workplace, or simply safeguarding the assets of the company, a surveillance system can accomplish that. If you are upgrading a current system with more cameras to utilize more space or if you are creating a complete new system with one camera or multiple cameras, JR-Tech has a tailored management solution integrated into your IT system. With JR-Tech we will customize a video surveillance management system to the business needs and ensure it accomplishes what you desire. JR-Tech has experienced specialists for the setup, management, and education of those that require the use of the system.